1) To have discussion with Working Families about foreclosures and share with them the possible ways of fighting for there homes. Steve Wyatt will do his presentation on social unionism, which will speak on the economic issue’s surrounding foreclosures, coalition building and UAW’s role in the community past and present in regards to fighting for Social and Economic Justice for all Working Families whether organized or not. Moratorium Now speak on the foreclosure moratorium struggle and Occupy Detroit will speak the coalitions use of direct action. 2) Provide specific legal and tactical information to people facing foreclosure. Attorneys Jerry Goldberg and Joe McGuire will share their legal knowledge with the Working Families in attendance. 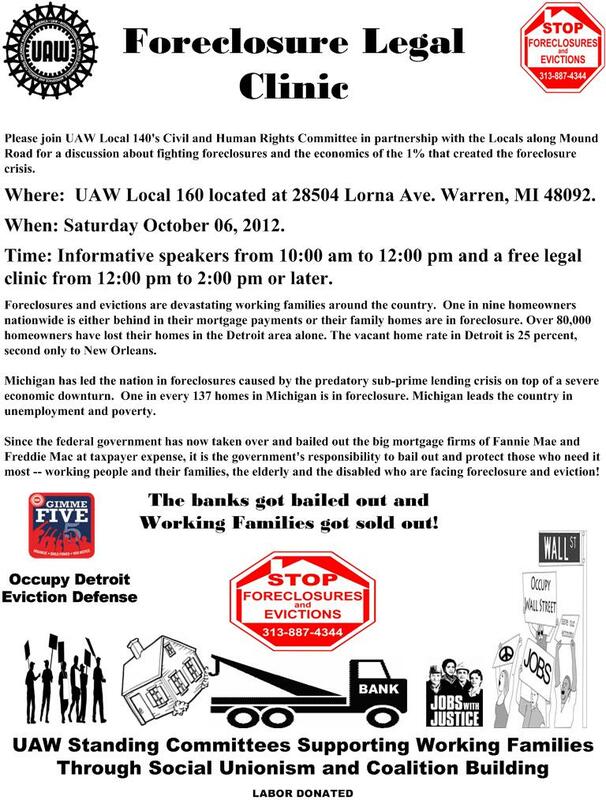 3) Encourage joint action between different UAW locals facing common problems while demonstrating the importance and effectiveness of coalition building as we work with our event partners Moratorium Now, Occupy Detroit Eviction Defense Committee and Jobs with Justice Jobs Committee. Moratorium Now and Occupy will handle the discussion, local 140’s Civil rights Committee will host the event in partnership with all of 140’s standing committees which will have tables along the wall to provide our guest with literature that is relevant to Working Families from each committee. Local 140’s Community Service Committee will lead the Community outreach campaign and Jobs With Justice’s Jobs Committee along with Moratorium Now will help build the event through individual and organizational outreach.